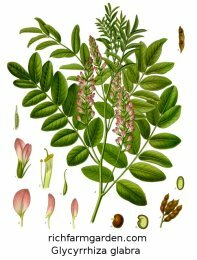 Licorice - Glycyrrhiza glabra - Tender Perennial - Medicinal, Culinary; The roots of this legume are used to flavor foods and candies and to treat sore throats and stomach upsets, arthritis and canker sores. 3 year old roots are ready to harvest. PArtial to full shade. Hardy to -10F (-23.3C); height: 60in.